Why is it that we have such a strong tendency to promote ourselves and talk about ourselves in ways that are intended to do nothing but try to impress others? I think James 3:13-16 gives us some really good clues: If you are wise and understand God’s ways, live a life of steady goodness so that only good deeds will pour forth. And if you don’t brag about the good you do, then you will be truly wise! But if you are bitterly jealous and there is selfish ambition in your hearts, don’t brag about being wise. That is the worst kind of lie. For jealousy and selfishness are not God’s kind of wisdom. Such things are earthly, unspiritual, and motivated by the Devil. For wherever there is jealousy and selfish ambition, there you will find disorder and every kind of evil. Bottom line: we either are bragging about the good things we do (and why would we do that? – to get the praise of humans! ), OR we are jealous and full of selfish ambition and so we brag about what we’ve done and how good we are – the “worst kind of lie” as James put it. Such things are not motivated by God or by trying to bring Him glory, but by the Devil! How much better off we’d be if no one was trying to impress others!!!! Let us be content to be what and who God created us to be. When we live that way, we bring Him glory! PRAYER: Father, may we trust in You to honor those who are genuine in Your time and may we not pursue the praise of other humans. Help us to be content to be what You have made us to be! In Jesus’ name, Amen. Power. How we are fascinated, yet sometimes revolted by it. We are a species fascinated by power. We woke up this morning in a world infatuated with it, and yet also a world where many are terrified of it. Power will be exercised today in your home, in your school, on the playground, in courts, businesses, hospitals, in the halls of political power. Some will use their power this day to abuse and mistreat other human beings – lording their power over them in the cruelest ways possible. Others will use their power to feed hungry bodies, comfort broken souls and hearts, to dig wells to quench thirst. To the human eye, it appears that evil is winning. Good seems to be on the scaffold, while evil sits enthroned in the hearts of men and spiritual beings throughout the universe. Our very own experiences reveal the persistence of the power of evil. One must question (especially at times when we are suffering from the slings and arrows of evil) what will rule the day. There is a power far beyond anything this world has understood or seen. That power was unleashed at the cross. It is a power that can change blackened hearts, not just dark actions. It is a power that can dump guilt and shame into the depths of the sea, never to surface again. It is the power that can make people like us – sinners all on a great magnitude of scale – “fit to stand in white robes before the throne of God.” Believest thou this? PRAYER: We fall before your cross in wonder that such love exists. May we never deny the power of the cross. In Jesus’ name, Amen. Pride and self-confidence are very dangerous things. 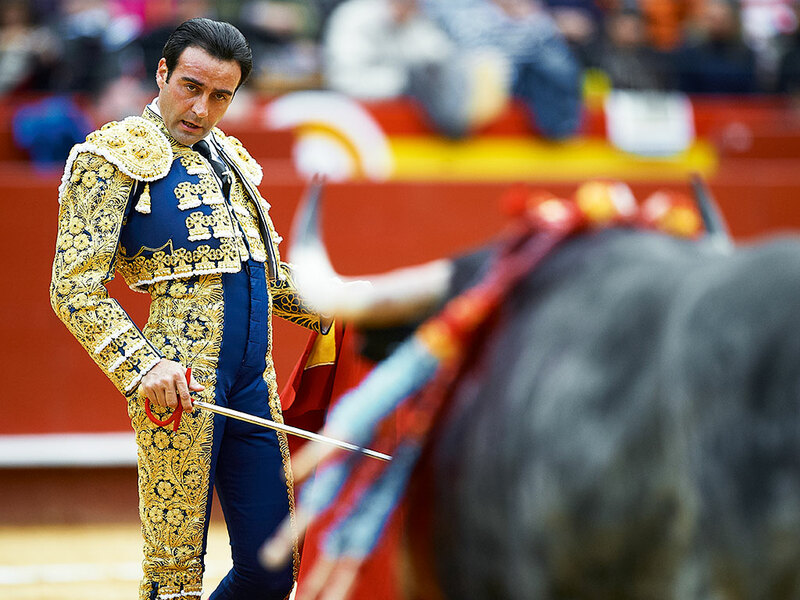 Witness this story: “Pali, this bull has killed me.” So said Jose Cubero, one of Spain’s most brilliant matadors, before he lost consciousness and died. Only 21 years old, he had been enjoying a spectacular career. However, in this 1958 bullfight, Jose made a tragic mistake. He thrust his sword a final time into a bleeding, delirious bull, which then collapsed. Considering the struggle finished, Jose turned to the crowd to acknowledge the applause. The bull, however, was not dead. It rose and lunged at the unsuspecting matador, its horn piercing his back and puncturing his heart. The matador trusted in himself to have killed the bull. It appeared to be dead. Jose was only focused on one thing at that time: hearing and acknowledging the applause of the crowd. His pride did him in – it caused him to become careless and it cost him his life. Romans 8.13b-14: … but if by the Spirit you put to death the misdeeds of the body, you will live, because those who are led by the Spirit of God are sons of God. THIRD: if we are too attuned to the crowd (the world) we will fail to see the danger of our pride. The world doesn’t care if we are proud – it just wants us to fall. The world (and Satan) wants us to rely on ourselves and our power and to grow prideful. FOURTH: when we attempt to stop sinning it is like thrusting the sword into a bleeding, delirious bull. Satan will become enraged with our desire to serve God and be done with sin. He will find any way possible to get back at us, including using pride about our “victory”. Just when we think we are done with pride and we turn to accept the congratulations of the crowd, pride stabs us in the back. We should never consider pride dead before we are. PRAYER: Teach us humility, Lord, and drown out the cheers of the crowd around us so we can hear only Your words of love and warning. In Jesus’ name, Amen. Ephesians 5:5-6 (NIV) – For of this you can be sure: No immoral, impure or greedy person–such a man is an idolater–has any inheritance in the kingdom of Christ and of God. Let no one deceive you with empty words, for because of such things God’s wrath comes on those who are disobedient. Job 15:31 (NIV) – Let him not deceive himself by trusting what is worthless, for he will get nothing in return. We are easily deceived. There are probably many reasons for it, but I think the main reason we are deceived is because we want to believe something strongly enough that we allow ourselves to be convinced it is true. And as Job points out, we don’t necessarily have to be deceived by others – we’re plenty good at deceiving ourselves. We deceive ourselves into thinking that we’re better than we really are, that we are smarter, more holy, more righteous than someone else and therefore God must like us better. We deceive ourselves into thinking that we’ve accomplished whatever we’ve managed to accomplish by our own wisdom, smarts and talent – forgetting the Source of the talent. But what really bothers me these days is how easily the people of God get deceived by the world and the smooth-talking salesmen of perversity. Evil is made to sound good, and good to sound evil and even hateful. The world has gotten very good at telling its story – I fear it is much more skilled at telling its story than we are at telling the story of what God has done. Well, you know what happened. He died on the spot. Some of us want to be with the crowd so badly that we end up in a mess. What does it profit a fly (or a person) if he escapes the web only to end up in the glue? May you be wise to the ways of the world because you are wiser to the ways of God! PRAYER: Give us discerning hearts and minds, O Lord, so that we are not led astray by the voice of the masses or by false appearances. May we heed the warnings that You have given us in Your Word and through Your Spirit. Preserve and protect us, we pray! In Jesus’ name, Amen. How’s your world going today? When you got up out of bed, did you leap up full of joy and excitement, or did you stub your toe or arise with a headache? There are things you plan to do today, right? Chances are, either formally or informally, you’ve got your day somewhat planned out. You know some things that are “must-get-done’s” and others that you can do if you get around to it. You know some of the people you’ll probably be talking with and what you’ll talk about. You may be filled with trepidation about some of those meetings, or excitement at the prospect of spending some time together with them. Either way, you have a schedule, a plan, in your mind for how you’ll spend your day. We like to think that we are in charge of our lives – that we have a significant say-so in how the day unfolds, how our interactions will turn out, and what we’ll do and where we’ll go. And, to some extent, we do have some control over some of it – at least, we have an illusion of control. We like to think that we are masters of our destinies – even if it’s just a small, insignificant destiny like planning to stop at Starbucks for a cup of joe on the way to work. Our little fiefdom, over which we rule…or so we think. One of the best commentaries about this is in a book on political science theory by a “theologian” you may have heard of, named Dr. Seuss. It’s a book called Yertle the Turtle. A little pond of turtles is ruled—or so he thinks—by Yertle, who’s a turtle. One day, he decides his kingdom needs extending. 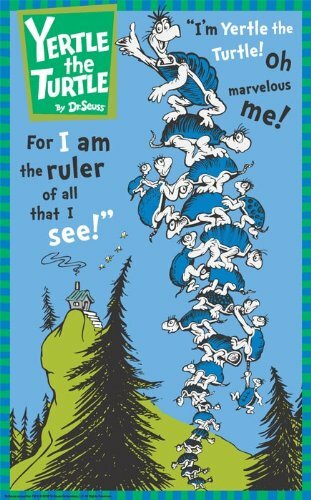 “I’m ruler,” said Yertle, “of all that I see. With this stone for a throne, I look down on my pond. This throne that I sit on is too low down. And so it happened that Yertle the Turtle sent out a decree that all the turtles that lived in his pond should be stacked up to be his throne—to extend his power and glory. The whole pond scrambles to obey; first dozens, then hundreds of turtles were positioned underneath Yertle, who rose higher and higher into the air until finally he was so high up that he could see for miles. For the turtle on the bottom did a plain little thing. He burped, and that burp shook the throne of the King. Is the King of the Mud. That’s all he can see. And that’s where all who lift themselves up eventually wind up – back down in the mud. We are all just one little burp away from reality. We think it’s about us: my family, my work, my friends. We want to fashion our lives into a kingdom we control. But every once in a while, there’s a little “burp” someplace and we’re reminded of reality. 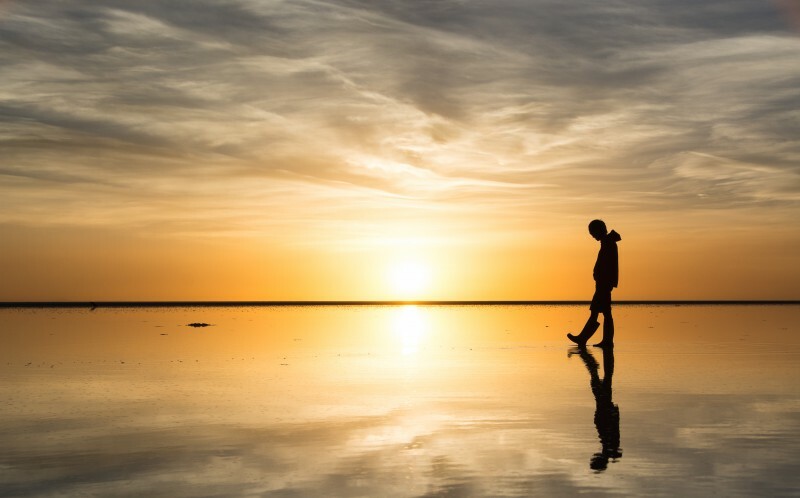 Luke 18:14 (KJV) – I tell you, this man went down to his house justified rather than the other: for every one that exalteth himself shall be abased; and he that humbleth himself shall be exalted. PRAYER: Give us this day the wisdom to keep You on the throne and may we be content to be Your servants! In Jesus’ name, Amen.